The second phase of the assault on your privacy – is the installation in your home of ‘smart appliances’ – particularly your thermostat, hot water heater, dishwasher, washer and dryer, electric stove, your electric rechargeable car, and any other high demand devices. What will make all these devices ‘smart’ is a chip in each one that communicates with your ‘smart meter’ to allow the utility to know exactly which appliances you are running at any given time and, to be able to send radio signals to turn off individual appliances in your home. Utilities will say they need this in order to avoid brownouts – or to avoid having to build new generator capacity to meet peak demand. Right now the federal government is ‘encouraging’ appliance manufacturers to develop and sell these new ‘smart meter compliant’ appliances. We think it will not be long before there will be no other kind of appliance on the market. Right now the utilities are telling people that programs that let the utility remotely turn off appliances are ‘voluntary’ and that those who ‘volunteer’ to participate in such a program will be rewarded with lower rates. We think these programs will be become less voluntary over time. We have not heard about any phase two for the gas and water meters as yet, but that may come too! I have washer & dryer purchased aprox 3 years ago – all digital. Probably can be hacked? What if I unplug? THANKS!! There is a possibility the appliances you bought 3 years ago do not contain ‘smart’ communication chips. They were making all digital machines for many years before the manufacturers (probably under govt pressure) started making their appliances ‘smart’. The way to find out is to buy or borrow a handheld meter that can measure radio frequency. Then place it near machines for awhile and startup a load of clothes or dishes. Watch for little blips when machine stops or starts. You may have to watch for awhile. If you find the machines are producing radio signals you could contact the manufacturer and see if there is any way to disable the radio transmissions. If there is not, you might consider selling the appliances and replacing them with good used appliances -if you value your health and privacy. Blanket surveillance is easily accomplished as long as you have smart appliances or any form of wireless in your home. Don’t fall into the trap of thinking that if you do not have a smart meter you are in the clear. 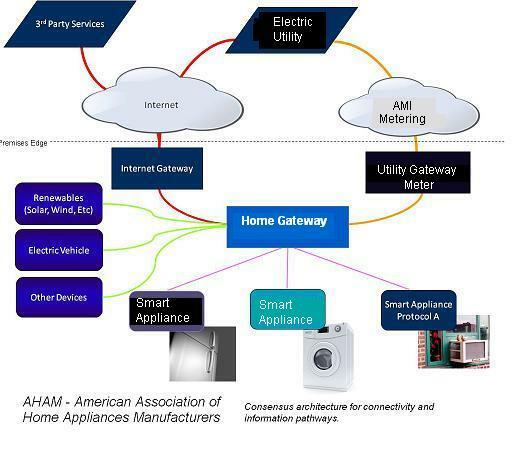 You don’t have to have a smart meter node on your own home in order for for these smart appliances to STILL be read by the utility or government using the gateway of any other smart meter in the whole wide area network. If you don’t protect, preserve and recondition your older appliances, if you don’t get rid of all wireless out of your home, including your modem, portable phone and baby monitor, you are just asking for total loss of privacy. Smart meters may not have taken over the same degree of direct control of your home if you resisted and are a hold out. But the circuit panel for everyone WITH a smart meter has been taken over, they as good as OWN it. Whether you yourself have a smart meter or not, the utility can use your neighbour’s smart meter against you. They might not quite as easily be able to remotely disable your “smart” appliances, but those other smart meters all around you can still use stealth wireless to surveil you inside your home and to track your actions successfully, They are still free to trespass technologically, They can still use connectivity to extract all your privately owned data and then sell it to third parties at enormous profit. Remember frontier law? Essentially lawless. Wireless is the new lawless frontier. It does not matter if break and enter and wiretapping wirelessly is accomplished via wifi, cell phone or the grid, it is theft all the same. The minute data is in wireless format, all bets are off. You lose your claim of ownership over possession of your own private information, which can still be extracted wirelessly. Wireless is its own jurisdiction, one in which any privacy rights concerning valuable private info about you and about your life are now up for grabs. Xy, Your idea that smart appliances could communicate through your neighbor’s smart meter is interesting. But I see a problem with that scenario. The smart appliances you buy and put into your home probably have nothing in their smart chips that would identify who owns them or what house they belong to. They would acquire this information only by being linked to the particular smart meter on your home which is known to belong to you the homeowner. So if your neighbor’s smart meter is capable of reading the signals from your appliances, would they not then be seen by the utility’s computers to be the appliances of your neighbor? How could they possibly show up as your appliances? This raises all sorts of questions. The physical distance between some of your appliances and your neighbor’s smart meter may well be less in many cases than the physical distance between those same appliances and your own smart meter. How does the system keep it all straight and associate the right appliances with the right houselhold?